Bring home Panasonic 307 L Frost Free Double Door Refrigerator and experience more freshness and more user comfort. The Econavi Sensors detect and analyse conditions of use to maintain ideal cooling and avoid wasting energy. Using the result of this analysis Panasonic's unique Inverter Technology, adjusts the rotation frequency of the motor and optimizes cooling performance for energy savings. The Surround cooling Airflow is an advanced mechanism that uses an independent airflow for the refrigerator and freezer compartments to cool them simultaneously. Thus ensuring temperature and humidity is maintained in each compartment to keep food fresh and crisp for long. The AG clean Technology used Silver Air filters to deactivate molds and bacteria in the circulating air and reduces odour. 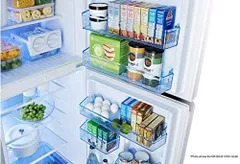 With 20% extra storage space in the Fresh Safe, now you can stuff your refrigerator with your favourite fruits, vegetable and all that you love without a second thought.